Deshpande Kaka (who is more of Kaka (Uncle) to me than my C.A) insisted that we must go to Bhuleshwar & Kanfinath. I searched for route to Bhuleshwar on the net and started early morning. Take Pune – Solapur Highway and drive approx. 30-35 Kms. 2 Kms. before Yavat village, take right turn along eastern bank of canal. You will see sign board “Bhuleshwar”. Drive approx. 8-10 Kms to reach Bhuleshwar Temple. As you begin, you will start getting view of Bhuleshwar temple located top on mountain. The road is in OK condition. Caution: On this way, there is a ghat stretch on around 3-4 Kms. and the road is steep so make sure that vehicle brake is in good condition. There is a very steep turn while climbing as you approach near the temple. We started on Solapur Highway and took right turn 2 Kms before village ‘Yavat’ and the fun began… We got a warm welcome from Parakeet family. These Parakeets had bluish tails. Then came Green bee-eaters, Drongos, Brahminy Mynas and Red-wattled lapwings. Each time we saw new bird, we waited there and clicked it. There was a villager who was following us on his bike. He was surprised on what we were clicking. We didn’t notice that he was following us. After a while, we gathered the daring and asked us “Whether we would be interested to see Gerbera plantation?” and we immediately nodded our heads in assertion. He took us to a nearby place. He had quick talk with the owner and we got permission inside the green house, which sheltered 4 hectares of Gerbera plantation. It was just unbelievable! There was endless panorama of colorful Gerbera flowers. It reminded us of tulips in “Dekha ek khwaab….” from Silsila movie. We captured these beautiful floras through our lenses. He also gave us info that 1 hectare of Gerbera worth at least one lakh rupees. It meant such cultivations are costly affairs. All these flowers are sold in Pune flower market for 1-2 rupees each. We were very thankful to that biker who showed us this elegant treasure. We climbed ghats to reach Bhuleshwar Temple on the mountaintop. The temple hilltop is huge and there is lot of parking space available for vehicles too. Bhuleshwar temple is built in 13th century and is dedicated to Lord Shiva. It was previously a fort called “Mangalgadh”. The devastated evidences show that this temple must have been ruined by Muslim invaders and reconstructed again. The entrance of temple is very interesting. It is called “Gaimukhi construction” which dates back to Shivaji Maharaj’s era. The walls of temple are decked with beautiful carvings right from entrance. There is mythological story that after Lord Shiva and Devi Parvati had fight and angry Shiva came here to meditate. Devi Parvati, dressed as “Bhilla” woman danced to fascinate Shiva. Her beauty seduced him. They went to Kailas from here and got re-united. The place got its name from this story. “To sedate” means “bhul” in Marathi. As Shiva was seduced by Paravati, hence he is also called “Bhuleshwar”. We bought Pooja thali (contained coconut, flowers, few issence thicks and a bowl with 5 pedhas) and went inside. It is believed that the god himself eats the Prasad which devotee offers him. We did not know about this. Pujari told us about this. 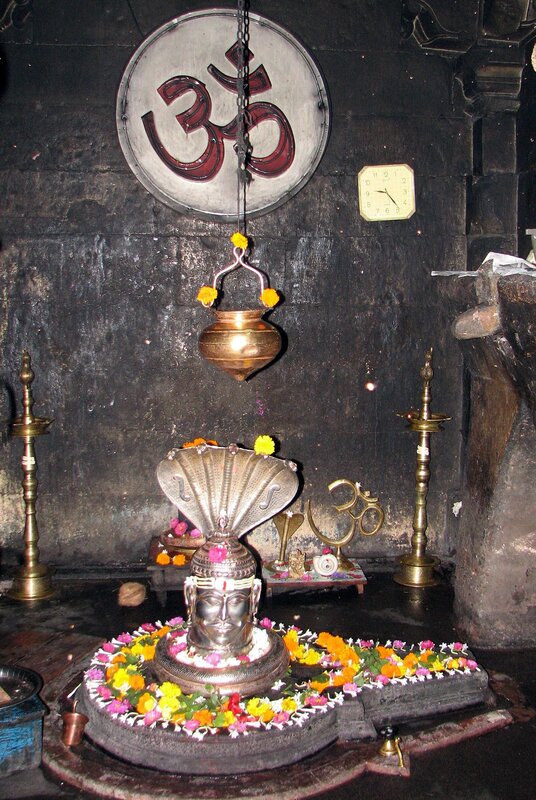 He kept the bowl of pedhas inside the shiv-linga and asked us to wait. After 10 mins, he took the bowl out. To our astonishment, it had only 2 pedhas in it. We tried to find out where did the rest pedhas disappeared, with the help of torch inside the shiv-linga. There were 3 stones whom they call “Brahma, Vishnu and Mahesh” and no rat, no snake, no cockroach inside. It was no black magic and nor did Pujari play any trick. Sometimes, there are things beyond your logic and science and you ought to believe them. We had that Prasad and explored the temple. There was huge Nandi inside the temple along with Ganapati idol in woman form. It is believed to be only such idol of Ganesh. Also there is huge spectacular bell outside the temple. We climbed upstairs and the view was beautiful. We found many Babblers, Mynahs, Ravens and Laughing Doves. We spent some time there and had few quick bites which we carried with us. We started our back journey and decided to take opposite route while returning. This is Bhuleshwar-Saswad road. We reached Saswad and had some food there. Our next destination was Kanifnath temple. We took up road to Kanifnath which went through small villages. It was lush all over and could get some uncommon birds like Indian Silver Bills, Ashy-crowned Sparrow Lark, Bushchat. Sweet melodious song of American Robin thrush caught our attention. It compelled us to wait there for while and admire these nature’s best creations. We were able to capture some picturesque landmarks in our camera. Take road Pune – Hadapsar – Saswad. In village Saswad, there is junction. From here, take road to Kanifnath. Drive approx for 10-15 Kms to reach Kanifnath. We climbed up Kanifnath and cool flowing breeze soothed our senses. Just cannot find words to explain how divine the atmosphere at the top was. We parked our car and reached Kanifnath temple. This beautiful architectural splendor is one of the Navnath temples. There is small cave opening inside the temple and women are not allowed to enter in that cave. Only men are eligible. Women can however sit in temple. We took up Prasad and started descending. We had to drive back to Saswad. We took up Saswad – Hadapsar – Pune road to reach Pune. We came back home in the evening and tried to recollect the day we spent. All the wonderful memories of the day flashed in our minds – beautiful Indian Silver Bills, Uncommon Ashy-crowned Sparrow Lark, amazing Gerberas, sweet melody of American Robin thrush, unbelievable carvings at Bhuleshwar, accepted Prasad by God which we offered, green landscapes on way to Kanifnath and cold breeze on Kanifnath top!! !